All Purpose Transport is committed to providing top service experiences for our clients. We strive to find transport and logistical solutions that are best suited to you. And you can rest assured we work hard to deliver nothing less than exceptional results. Our culture of service excellence isn’t something we simply believe in. We have the awards, the recognition, and – most importantly – the customer satisfaction to prove that we achieve it. 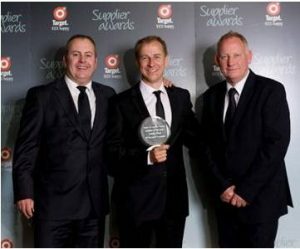 In 2011, All Purpose Transport was named Supplier of the Year at the Target Supplier of the Year Awards. 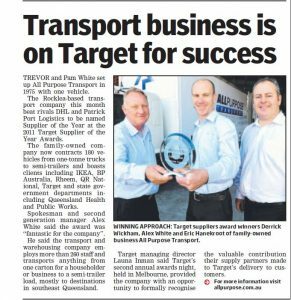 This transport and logistics award was in recognition of the valued work APT does as a supply partner to Target in delivering goods to customers. Our passion for being a trusted company in the eyes of our clients is of the upmost importance. We don’t take for granted this trust and are dedicated to delivering goods and packages safely and on time. 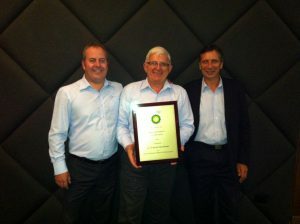 We are proud to receive BP Queensland’s 2011 award for Recognition of Service Excellence. We were awarded with this honour thanks to the hard, diligent work performed by our people each and every day to transport and deliver goods on time – even when deadlines are tight. Every member of our team is reliable, professional, and incredibly helpful. We like to solve problems for our clients as they come up and work with them to deliver exceptional results every time. 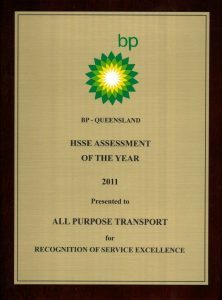 All Purpose Transport was presented with a Certificate of High Achievement by BP Queensland in 2011. 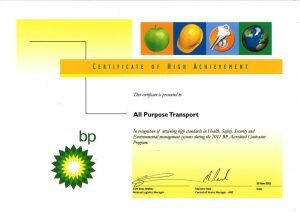 This recognised the efforts by our team while participating in BP’s Accredited Contractor Program. This was an opportunity for our systems to be appraised and for us to provide assurance to our clients that we aim for the highest standards in everything we do. We’re pleased to have exceeded the benchmark assessment across all the major components – health, safety, security, and environmental management systems. This demonstrates our ability to implement best practices across every aspect of our work. We continue to strive for service excellence and to raise the bar in the transportation industry. Our clients are incredibly valuable to us, and we’ll always work hard to ensure their needs are met.